Dennis Oppenheim, Stills from Gingerbread Man (detail), 1970–71, black-and-white and color photographs, collage, text, 60 x 40". In the summer of 1969, Dennis Oppenheim debuted new work at Yvon Lambert Gallery in Milan; included in this exhibition was a sound track of his footsteps made while walking through the city. This piece inspired Oppenheim to shift focus from Land art to the more intimate site of his own body. What followed, including the seminal Reading Position for Second-Degree Burn, 1970, in which Oppenheim’s skin was “painted” red by absorbing rays of sunlight, was a series of works probing relationships between the body and its surroundings, between art and life. These approaches resonate through contemporary art—perhaps now more than ever, given the looming environmental disaster on the one hand, and the multiplying selves of new-media culture on the other. Oppenheim has since moved on (since the early 1980s he has been incorporating architecture and design in large-scale sculptures and installations), but these early works remain pivotal and—despite the grainy quality of video from the era—often fresher and more topical than much video work being done today. 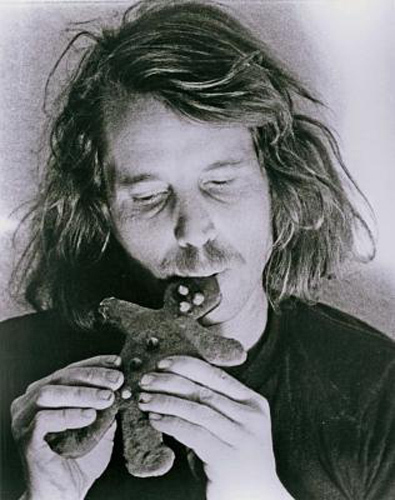 One finds a transcendent poetry in Oppenheim’s simple actions—such as covering his hand with piles of rocks or leaves or glass—and a profundity in his childlike inquisitiveness about the confines of the body—as in Stills from Gingerbread Man, 1970–71, for which the artist ate three gingerbread men and recorded the consumption and digestion of the cookies via photographs of his body and insides. This exhibition of works from the early ’70s, in particular a new compilation of videos made between 1970 and 1974, titled Tooth and Nail, frames questions about the boundaries and finitude of the self that, far from being resolved, have only been amplified in intervening decades.